SECAUCUS, N.J., April 5, 2012 /PRNewswire/ -- Panasonic today announced a new digital interchangeable lens system camera, the LUMIX DMC-GF5, which joins Panasonic's award-winning LUMIX G Series of digital cameras, which are acclaimed for their high image quality with small and compact body and lenses. The LUMIX GF5 features a newly developed 12.1-megapixel Live MOS sensor and redesigned Venus Engine, helping to ensure true-to-life images through exceptional resolution, image rendering and color reproduction. Even in low-light situations and at a maximum 12800 high ISO sensitivity, the LUMIX GF5 produces stunning photos and videos. The noise reduction system includes a combination 3DNR (3D Noise Reduction) and MNR (Multi-process Noise Reduction) allowing for both bright areas and dark areas to be faithfully reproduced with minimal noise in high sensitivity image recording. 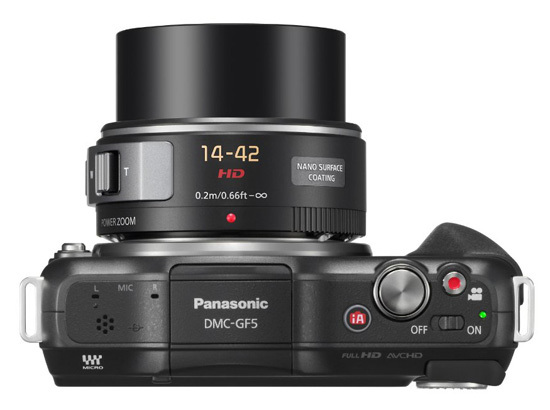 "Panasonic expects the LUMIX GF5 to please photo enthusiasts and budding photographers that are looking for the next step from the traditional point-and-shoot camera," said Christopher Rice, Senior Product Manager, Imaging, Panasonic Consumer Marketing Company of North America. "The camera's host of shooting options makes photography even more artistic, yet easy for users of any experience level. The powerful Venus Engine and sensor allows the camera to achieve exceptional photo quality in a range of shooting environments." Featuring an ultra high-speed Light Speed AF, the LUMIX GF5 can focus in approximately 0.09*(1) seconds making it possible to capture even fast moving subjects clearly. Combined with Touch AF control and high-speed burst shooting at four frames per second in full resolution, it has never been easier to capture fast-moving objects clearly. Additionally, Pinpoint AF allows for even more precise focus by further enlarging the focus area, assisting, for example, to set focus directly on the pupil of an eye. 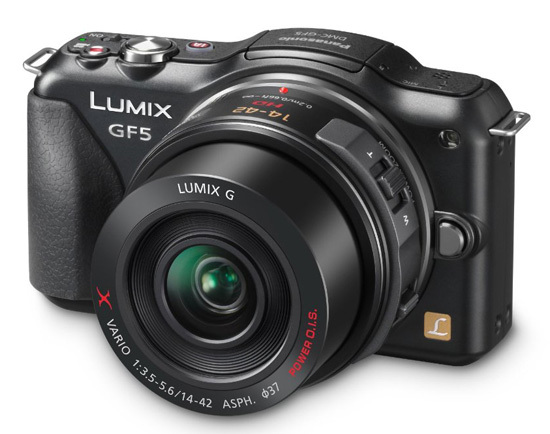 The LUMIX GF5's large, 3.0-inch 920,000-dot high-precision touch display and Graphic User Interface (GUI) provide users with ease of use and simple operation. The touch-control system immediately allows users to set focus on a subject just by touching the screen and users can even release the shutter to snap a photo directly from the touch screen. Once a user locks onto a subject by a touch, the camera will track the subject with the AF tracking function, even if the subject moves. Touch Zoom is also available when the LUMIX Power Zoom Lens H-PS14042 lens or H-PS45175 is mounted. Creative Control Mode has been upgraded from the LUMIX DMC-GF3 by increasing filter options available on the LUMIX GF5 from six options to 14, adding Soft Focus*(2), Dynamic Monochrome, Impressive Art, One Point Color, Cross Process, Low Key, Toy Effect and Star Filter*(2), in addition to the conventional Expressive, Retro, High Key, Sepia, Hi Dynamic and Miniature Effect*(3) modes. With the new GUI menu tab, switching filter effects is seamless. A preview of filter effects can be seen on the large LCD screen via Live View mode and the camera intuitively recommends filters depending on the scene that the camera detects in iA (Intelligent Auto) or iA Plus mode. For beginner users of interchangeable lens system cameras, the GF5 features a new Scene Guide offering 23 sample pictures shot by professional photographers. Users can choose the photo closest to the situation that they are shooting and optimal parameters for shooting the scene will be set automatically*(4). Additionally, procedures, technical advice and recommended interchangeable lens options for the scene can be shown to allow users to better understand and learn photography. In addition to shooting still photography, the LUMIX GF5 can also record 1920x1080 60i* full-High Definition videos in AVCHD format which excels in both compression efficiency and compatibility with AV equipment for playback. In addition to practical full-time AF, the Touch AF in video recording also lets the user enjoy professional-like selective focusing which allows the focus to be changed while shooting video. The LUMIX GF5 features a dedicated video record button on the top of the body so users can instantly start recording videos while shooting photos without having to make setting adjustments. Along with full-HD video capabilities, the LUMIX GF5 also features high-quality sound, recorded with Dolby® Digital Stereo Creator. Videos can be recorded in MP4 format for playback on a PC or other portable electronic devices without having to convert the files. This entry was posted in Panasonic and tagged Panasonic GF5. Bookmark the permalink. Trackbacks are closed, but you can post a comment.